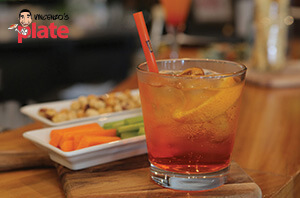 Aperol Spritz is the most popular cocktail in Italy, the Spritz, in the special series, Aperitivo with Vincenzo’s Plate. Enjoy this refreshing drink with some bite size delights and dive into a slice of Italy at home with friends. 1. Fill a rock glass with ice. 4. Pour a dash of soda water on top. 5. Garnish with a thin slice of orange. 6. Put a short straw inside, swirl it around to mix the ingredients. a. Bread sticks and olives. b. Carrot and celery sticks served with mayonnaise or dip. c.	My FAVORITE Vincenzo’s Plate Tuna Pasta Salad.